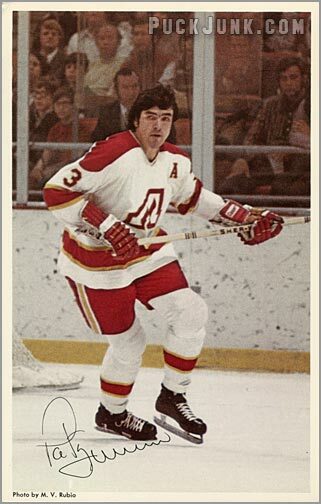 Most hockey card photography from the late 1960s and early 1970s consisted of either portraits or posed shots. By the mid-70s, Topps and O-Pee-Chee started to use game action photography. And nothing says ACTION like two hockey players fighting. Phil Roberto, of the St. Louis Blues, is shown here fighting New York Islanders’ goaltender Billy Smith while two linesmen attempt to break them up. As often as fighting happened in the 1980s, or even considering all those bench-clearing brawls from the 1970s, I am surprised that we didn’t see more cards with photos of players slugging it out. 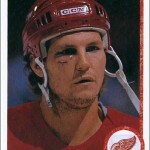 I can’t think of a single Bob Probert, Stu Grimson or Marty McSorley card that showed any of these guys fighting. 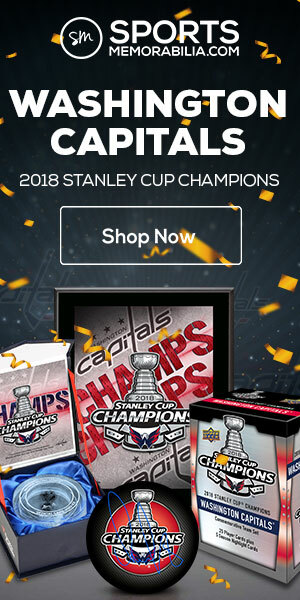 Not to say that there isn’t some random Score or Fleer card from the 90s showing these guys in the middle of a scuffle. But I doubt it. 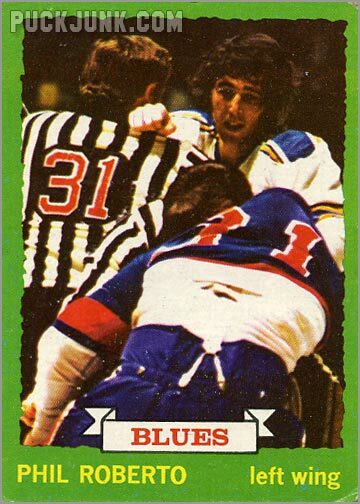 This is one of only two cards I can think of that show fighting – the other is of referee Dan Marouelli, where he is breaking up a fight (1990-91 Pro Set, card 692). 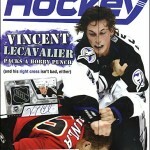 Fighting has always been part of pro hockey – and perhaps it always will be. 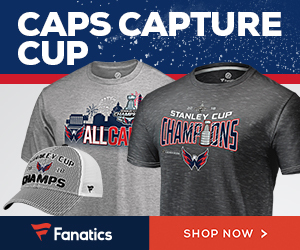 But the National Hockey League downplays the fighting aspect of hockey. Many of us still remember when Electronic Arts “took fighting out” of the video game NHL ’94 – by the NHL’s request. 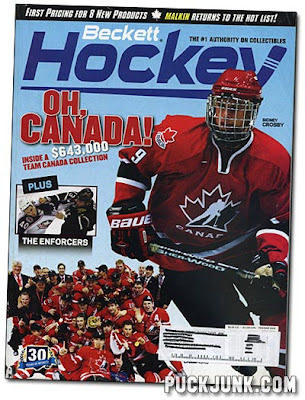 And for the most part, showing fighting was not allowed on hockey trading cards, as it no doubt helps to portray a negative image of hockey…at least in NHL Commissioner Gary Bettman’s eyes. 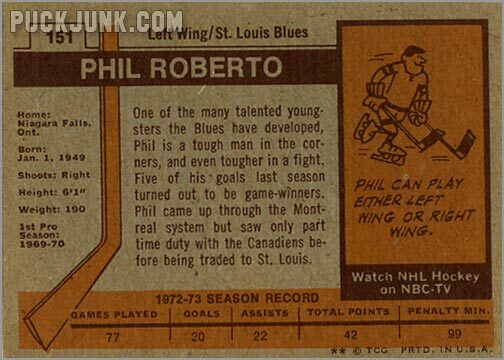 Phil Roberto played from 1970 to 1977 in the NHL, and one season thereafter in the World Hockey Association. 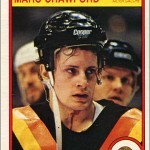 He was known as a tough player, but his career was sidelined in 1973 by a severe, non-hockey related injury. Roberto’s arm went through a glass door, as he raised his hands to keep the door from hitting him in the face. This cut his arm bad, causing nerve damage. 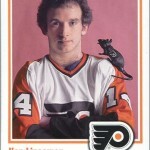 After extensive therapy, he made a recovery, and returned to the ice. Notice that the back of the card states “Phil is a tough man in the corners, and even tougher in a fight.” Not only does this card show fighting…it acknowledges it too!